Jack Whitten was born in 1939 in Bessemer, Alabama. He grew up in the segregated American South and suffered the effects of ingrained racism. He attended college at Southern University in Baton Rouge, Louisiana and also attended the Tuskeegee Institute. In 1960, he took a bus to New York City. He began his studies at The Cooper Year that year, and graduated in 1964. He lived the remainder of his life in New York City. Jack Whitten is a leading, recognized figure in contemporary art, and a beloved Cooper Union Art professor for many years. A well know series of work is called “Black Monoliths” which are “mosaic paintings.” They honor black visionaries in politics and the arts, like Ralph Ellison and Muhammad Ali. Jack Whitten A’64 was a leading, recognized figure in contemporary art, and a beloved Cooper Union Art professor for 25 years. He began teaching at The Cooper Union as a Visiting Artist in 1971. In 2014, the Museum of Contemporary Art in San Diego, California, hosted a major retrospective exhibition which later traveled to the Wexner Center for the Arts and the Walker Art Center. A 40-work survey of his sculptures will open in April 2018 at the Baltimore Museum of Art, and will later travel to the Metropolitan Museum of Art. Mr. Whitten passed away on January 20, 2018. He was 78. 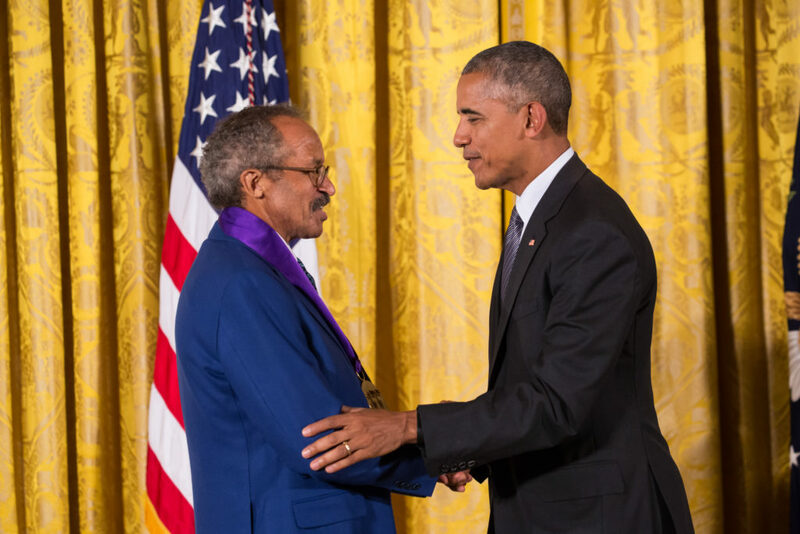 President Barack Obama honored him with the 2015 National Medal of the Arts. This medal was created by the United States Congress in 1984 and is considered to be the among the most prestigious awards granted to an individual in the arts. Watch Video of Ceremony. He will receive the CUAA Augustus Saint-Gaudens award on June 1, 2018 and be inducted into the Cooper Union Hall of Fame at that time. This entry was tagged Abstract art, Augustus Saint Gaudens Award, Jack Whitten. Bookmark the permalink.